MIAMI (CNS) — While many celebrated loudly on the streets, the death of Fidel Castro triggered a more subdued reaction among the Cuban exiles who attended the noon Mass Nov. 26 at the National Shrine of Our Lady Charity. Gutierrez used the Cuban slang — “caballo,” or horse — for Castro, whose death had been announced earlier that morning. The 90-year-old reportedly died late at night Nov. 25. But his 57-year-old regime continues to rule Cuba, with his younger brother, Raul Castro, now at the helm. That is why, despite the joy on the streets of Little Havana, Westchester and Hialeah, the death of Fidel Castro in 2016 means much less than it would have in 1976 or even 2006. An oppressive regime still shackles basic freedoms on the island, keeping a stranglehold on a beleaguered economy. In 1976, Cuba’s Communist Party approved a new socialist constitution and Fidel was elected president. Before that, starting in 1959, he was prime minister following the successful revolution he led to overturn the Batista regime. In 2006, while he underwent intestinal surgery, Fidel temporarily turned over power to younger brother Raul. He resigned in 2008 and Cuba’s National Assembly named Raul the new president. Raul, now 85, was re-elected in 2013. “(Fidel’s) been out of it for 10 years. 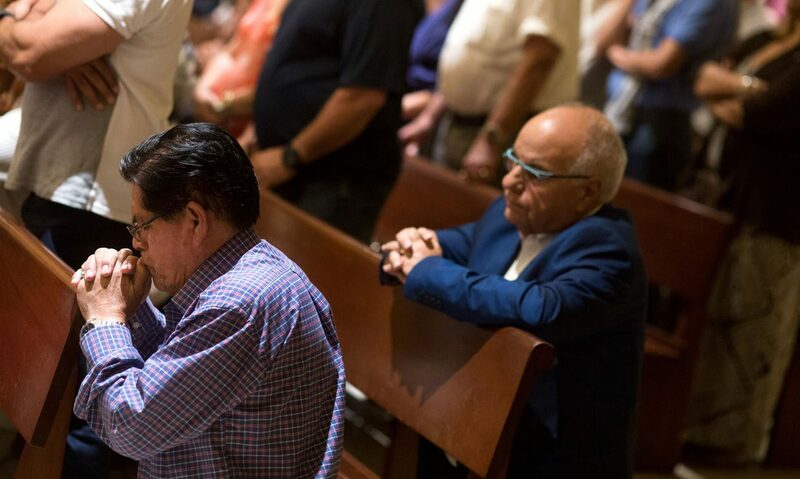 It’s his brother and the clique that surrounds him,” said Gutierrez, noting that he has been coming to noon Mass at the shrine every Saturday for decades. “She brought me,” he said, referring to Cuba’s beloved patroness, Our Lady of Charity. Gutierrez is not exaggerating. He is the man who, at age 22, smuggled her image into Miami on her feast day, Sept. 8, 1961. Nearly 10,000 exiles welcomed her that night during an emotional Mass at Bobby Maduro Stadium, which has since been torn down. Her presence provided a spiritual boost to the early exiles and ultimately resulted in the construction of the shrine — known as La Ermita — along Biscayne Bay. It remains a beacon of Cuban faith and patriotism, and also a place where exiles and immigrants from all the nations of Latin America come to give thanks or seek Mary’s intercession. His feelings were echoed by Marizol and Alfredo Mendez, who also come to the shrine every Saturday, out of devotion to Mary and to spend some time “in peace,” as he put it. “It’s a relief, a new dawn,” said Alfredo of Castro’s passing. He and Marizol left Cuba for Spain and arrived in the U.S. five years later, in 1978. They have never gone back. For the Mendezes and all the others celebrating on the streets or marking the day quietly at home, Castro’s death caused memories to surface: of lives interrupted or ended, of courage and sacrifices made, of parents and grandparents who longed to see this day but died before doing so. Alfredo Mendez recalled the violent, early days of Castro’s revolution, when priests and religious were persecuted. He personally sheltered one of them: Father Feliciano del Vals of the church of San Juan de Letran in Havana’s El Vedado neighborhood. The priest was among thousands arrested in the days prior to the Bay of Pigs invasion in 1961, a failed effort backed by the United States, Mendez said, and held for two weeks in miserable conditions at the Blanquita Theater in Havana. After the invasion, the priest found refuge for 40 days with Mendez’s family. After a futile search for asylum in a foreign embassy, he was rearrested, put on a ship, the Covadonga, and sent into exile in Spain with more than 100 other priests — including Miami Auxiliary Bishop Agustin Roman, the shrine’s longtime rector, who died in 2012. It’s those memories, that pain, that hurt, that Father Fernando Heria, the shrine’s newly appointed rector, spoke of during his homily at the Mass. His uncle was killed by a Castro firing squad Sept. 16, 1961. In that sense, said Carlos Perez, Castro’s passing is cause for hope, if not joy. “He was an obstacle to reconciliation among Cubans. He sowed distrust among Cubans. He sowed the separation of families,” said Perez, who left Cuba 20 years ago, at the age of 43. His father left the island when Carlos was 11 and died in the U.S. The two never saw each other again. Perez spent 17 years in Chile and Bolivia — where he met his wife — before coming to Miami eight months ago. The move here allowed him to reconnect with his family. “And it was as if nothing had happened. I received the same tenderness as always, the same love as always,” he said. Later that evening, Miami Archbishop Thomas G. Wenski celebrated the 8 p.m. Mass at the shrine. In his homily, he echoed the words in the statement he had issued earlier that day, when the news of Castro’s death first broke.